This suit is one of those projects that frustrates to no end before being completed. It was in time out several times, but now I'm going to leave it as it is and be alright with it! 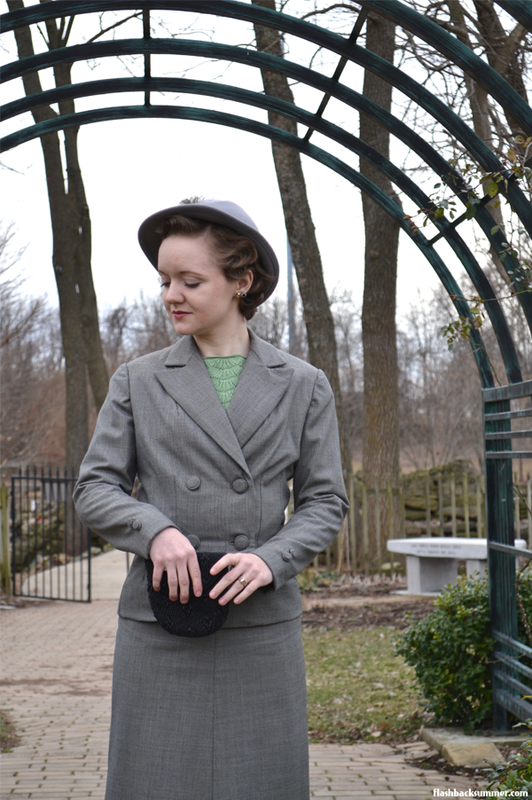 This suit is a combination of a couple original 1930s patterns. 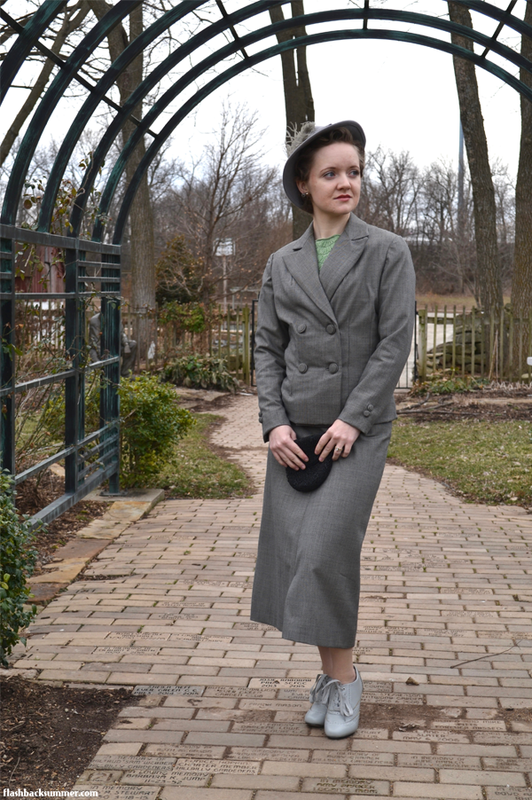 The blazer is Simplicity 2395 on the right in the picture below, and the skirt is Simplicity 1739 on the left. I also planned for this suit to be extremely versatile for my wardrobe, so it matches a pair of trousers I made. Now I can have a skirt suit or a pant suit! The frustration with this suit, however, lies mainly in the blazer. I watched a Craftsy tailoring techniques class and applied what I learned on the blazer. It feels fantastically structured. It is lined, underlined, and reinforced by pad stitching and horsehair canvas inside. However... It just has strange wrinkles everywhere. I sized down on the pattern, yet it still has a strange fit. I can't decide if it's a mistake on my part or just how the pattern itself fits. Early-to-mid 30s suits weren't the nipped-waist fit we have come to expect in a more modern suit fit, so I'm not sure if it's my modern expectations or what. If you have a theory, I'd love to hear it! Although the fit is strange, I must take a moment to brag on my button-making victory. I made matching buttons for the front and decorative ones for the sleeves. They're self-covered buttons made of O-rings from the hardware store and various mismatched but same-sized old buttons. I followed this tutorial, and it worked brilliantly! I love the high-end touch it adds. I also tried desperately to properly finger wave my hair, but only one side turned out very successfully. My hair is still just a bit too short and layered to work very well. However, I shall try again in time, for I do love them! I paired it with a 1960s (or 70s?) 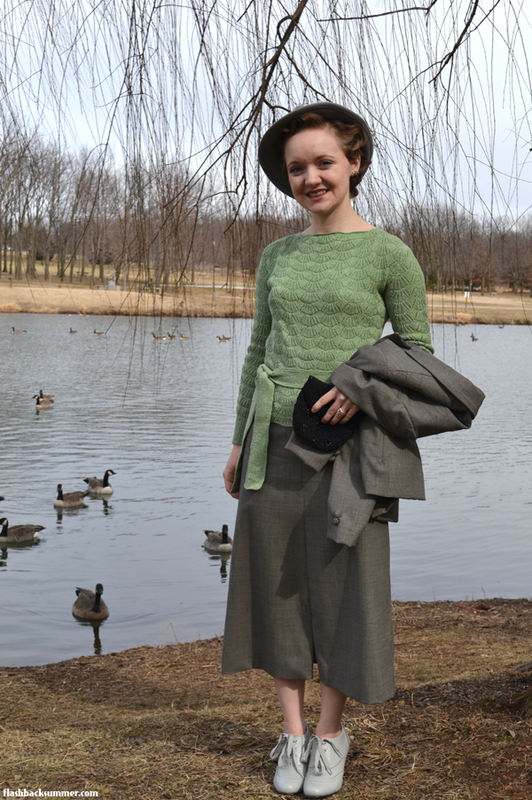 does 30s hat, a 1930s jadeite-colored sweater (my favorite color! 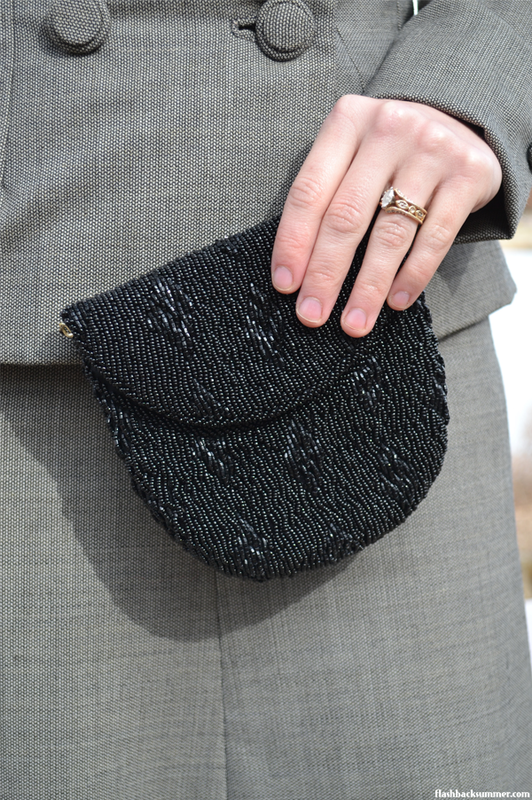 ), a beaded black purse, and the Dance it Up Heels in dove from Modcloth. I just got these heels for Christmas, and I rather like them. 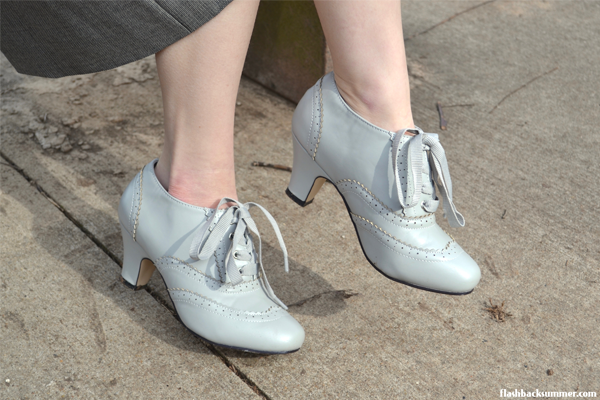 The detailing is nice, and they have a generically vintage look that works for my usual 30s-40s looks. They are spot on in size and fit my size 5 feet well. I wish they were narrower, but that's a common wish with my unusually narrow feet! Have you any experience with early 1930s suits? I'm not exactly sure on the age of the patterns I used, but I was guessing mid-30s. What do you guys think? Some nitpicky thoughts as to why the suit might not fit the way you'd like. -- The shoulders aren't in the correct place for your actual shoulders, and aren't padded enough/properly? to make it work for that far out from your shoulders. -- some of this could be that it needed more steam shaping during creation. Steam + wool does MAGIC. -- huh, thinking on the way the fabric is being tugged off grain, I wonder if that's a mismatch between the outer layer + the interfacing, or the outer layer + the lining? Sometimes a perfectly created thing can get confubbled in the putting of layers together. But as said, this is nitpicky stuff that could have been what's "wrong" with your suit coat. I think it looks lovely, and I hope you wear the heck out of it and love it! Grey suits are so versatile and useful! And I have to say, your collar points are SPOT ON. Fabulous job! And an addendum: when I was showing this post to my husband, he gasped and wanted to know what era was being represented because it looked like you'd stepped out of an old photo. That it was styled perfectly for when it was (he doesn't study clothes history). Wow, well thank you! I appreciate that! Thanks for the tips! I think I'm going to track down a tailoring connection in town and see if she can help me work out the issues in person. I'm at a loss to try to fix it again myself. It looks beautiful! Bravo to you for tackling such an intense project. My two cents (it is hard to tell from photos though, especially when you are posing rather than standing erect) is that the you might have needed an s.b.a. for the jacket. If you look at the illustration, she has a lot of fullness above the top buttons. You can tell if this is a problem by stuffing your bust area up a bit and then trying the jacket on over it. The pulling there could also be from overlapping too far though. If you "let it out" by moving the buttons at least it looks like there are plenty of other places to take it in. The sleeves look wide on you too. You said you sized down...do you mean your pattern was bigger than your size and you graded it down? If so, the armscye might be bigger around than it should be and the sleeves just aren't slender enough for you arms to fill them out. Either way, I think you're lucky to be able to pull off the 30s look so well and those buttons you made are fabulous! It's a pattern intended for a 30" bust, and I've got a 32" bust. This is why I'm confused! You may be right about having pulled the buttons over too far to close without wrinkles. I may try moving them. This whole look is fabulous. The skirt length is just perfect, and love the sweater. I'm about to tackle my first ever suit/tailoring project, I'm pretty nervous about it! You look very cute. Congratulations for completing a suit! As far as jacket fit, it does appear to be too large in the shoulders and bust. One thing that can help sometimes is choosing a pattern by your high bust measurement, as that usually provides a good fit in the shoulders/neckline, and then grading out below there if needed. It looks as though it may have been drafted for a slightly longer torso or different waist location. Does it have anchor buttons? Oh, have you checked if you have one shoulder slightly lower than the other? You can adjust for that. You did a fine job! Tailoring is my forte but it looks like you've got a lot of answers from others to tackle with. I just want to put in just one tiny piece of my two cents on it in brief. I think it might be something as simple as your lining wants to be cut or put in differently. Don't be discouraged because I've seen so much worse from some I've taught. I actually like the suit and most times its some problem somewhere so simple to fix! Also, looking at it again I would put your buttons a tad lower next time you'll be surprised at the difference. Keep going! Your doing fine! Your work looks really great - and I love your styling! To remedy the jacket - I'd take out the lining as the poster above suggests and see if that helps - is your lining bigger than the jacket? You need extra ease in the lining (even though that doesn't seem like it makes sense). Possibly some kind of chest shield would help fill out that extra room above the bust, but you could also try taking in the princess seams. 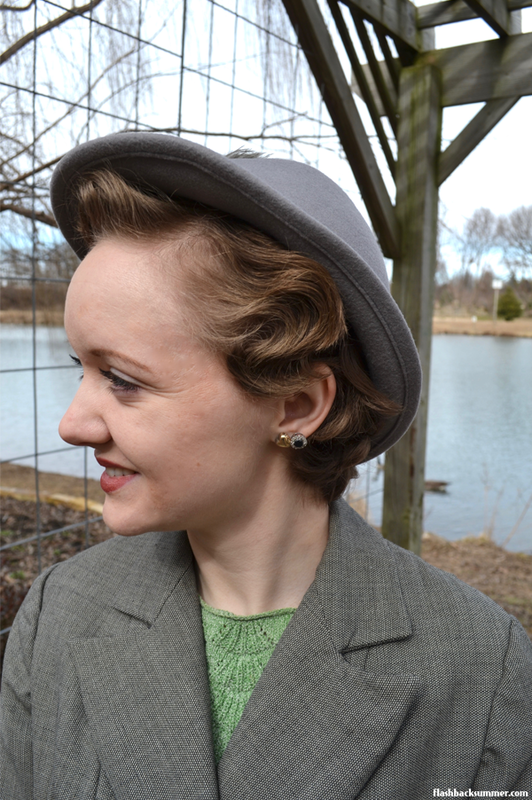 My suggestion for future jacket projects would be to use a Burda pattern and simply add in the vintage details you love. 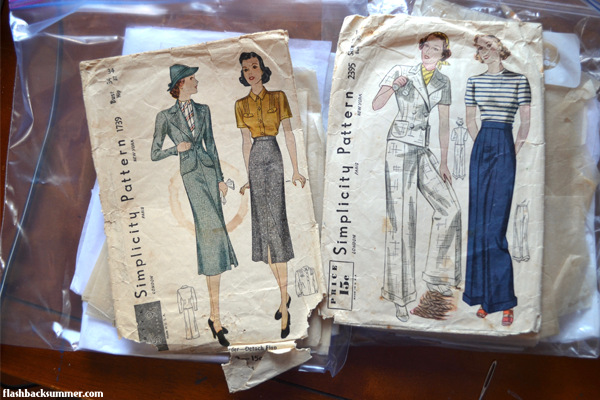 I find that Burda is exceptionally well drafted and might help take out some of the frustration factor of using a vintage pattern. But take pride in your jacket - I reckon with a few tweaks you could improve some of the fit issues. Thank you so much, Caroline! Yes, I think I'm going to track down a pro in town to help me with the fit. I think I'm in over my head. I hope this helps you a bit Emileigh! You did a fantastic job on your first tailoring venture, and those buttons look fabulous. I think you have made a super suit, what a great outfit! I love your green jumper, such a pretty stitch pattern. I think the suit looks lovely, and any ill-fitting in the blazer is definitely not noticeable, at least not in your pictures. It's hard when you have to downsize to get a better fit- I know this too well. 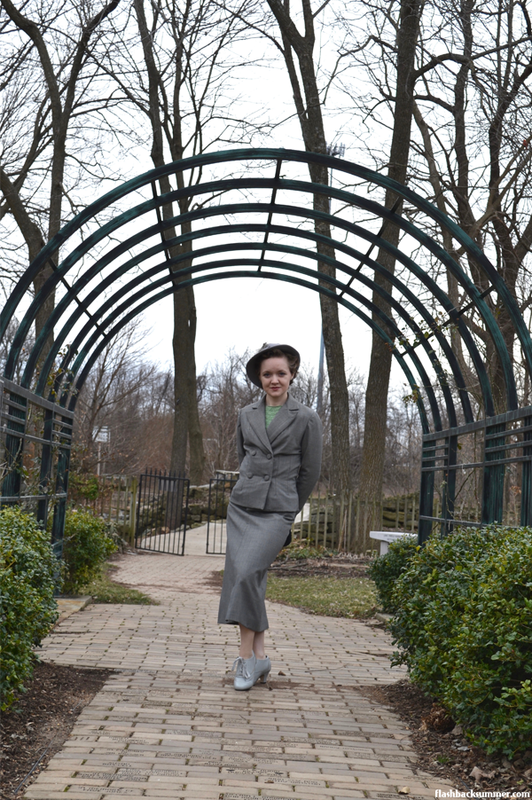 But don't worry, you are the embodiment of 30's chic in this photo shoot Emileigh, well done! Aw, thank you so much Ali! I appreciate it! This suit is lovely! I think the jacket looks quite impressive! It may be just one of those things where you are still much to "in" the project, too close to the frustrations, to really see it clearly. I especially think the collar looks super great, I have yet to tailor a collar myself and am quite afraid of the process! Perhaps once the dust clears a bit you will like it a bit more, you certainly look super chic and very authentically 30s! Thank you for linking my button-tutorial! I love your suit, skirt seems to fit perfectly and the knit blouse is to die for. As for the jacket. I think your problem might be that sleeves are a bit too wide around the shoulder and biceps. Removing some width from the sleeve should also get rid of some of the wrinkles on the attaching sleeve seam. Also sleeves are sitting slightly too far from your neckline (unless you want to replace the shoulder pads with wider ones which makes the silhouette look closer to the picture in the pattern sleeve). Moving them just 2 cm closer to the neckline should make them sit properly on the shoulder. When you move sleeves closer to the neckline on the shoulder, you should also move the seam closer to bust in front, that should get rid of some looseness around the bust. I have found double-breasted jackets a bit of a problematic items. Atleast on me, with larger bust, they never sit very nicely and create similar pulling to the side. That should not be the case here, but perhaps the fabric would have required even sturdier support material to prevent pulling and creasing. By the way, did you put inner button on the front side that is under the buttoning? If not, adding that might get rid of some pulling on the left side of the jacket. Anyway the jacket worked out lovely. It certainly looks like a good wardrobe staple. Odd fitting issues are something that can be solved overtime when your skills get better. You might be able to fix this later to fit better. I really enjoy your site and because you asked if there might be any suggestions concerning the cause of the extra wrinkles / bunching in the jacket you have made I tried to analyze what might have caused this behavior. You mentioned that you modified the pattern for your personal fit but I wonder if you adjusted for the difference in the your back length and shoulder measurements compared to that of the pattern? You appear to be petite and because of that you may have needed to adjust for both of these measurements. If that were the case (that you did not) it might explain why you are seeing the bunching. In my mind it would mean that you have a bit of extra fabric length (due to your back length measurements versus that of the pattern) and width (due to your shoulder measurements versus that of the pattern) being forced to fit in a smaller area. I actually considered this before adjusting the pattern, and my waistline actually fell at the waistline marking on the pattern. I asked a very savvy sewing friend, and she suggested larger darts going from the shoulder to the bust and pinned it out for me, and it looks like it's going to work brilliantly! Once I regain the motivation to look at this jacket again, that is.